The first of the ?video eyewear? phenomenon, the Icuiti V920 arrived in the world in early 2005. This thin strip was the first time the concept of a hybrid head mounted / heads up display had been launched. 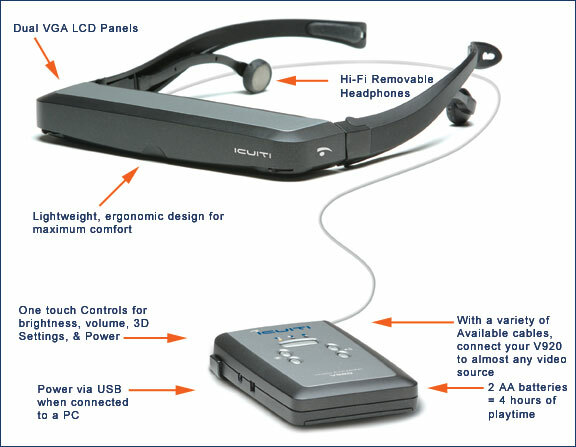 Weighing just five ounces all told, the v920 uses a liquid crystal display strip embedded in a narrow tube that can be worn directly or perched on top of a pair of glasses. A set of high-quality headphones are detachable from the main unit, allowing sound to be added to the experience. This set-up, allows for the virtual image to be projected in front of your eyes as if there was a real a 42 inch LCD monitor hovering from a distance of 7 ? feet. Yet, at the same time the configuration allows you to see where you are going in the physical world, and leaves your peripheral vision free for other tasks. All controls for the V920, including the power supply, are housed in a handy, credit-card sized control unit weighing only 3.8 oz, including the batteries. This is then connected to the display system by a long wire, allowing the controls to be housed in your pocket or about your person, and further eliminating any possibility of neck ache or discomfort. The display itself is quite optimal. The display is crisp and sharp thanks to a pair of EDTV 640 x 480 backlit AMLCD screens. Both screens will focus independently, making the device perfect for intense full 3D stereoscopic images. The V920 is a flexible display, it connects to virtually any mobile or home video source that outputs composite video, or with optional cables, S-Video or VGA. Typical video sources include stationary or portable DVD players, A/V Cell phones, multi-media players, an iPOD photo, Play station 2/3, Xbox or Xbox360, Nintendo or desktop and laptop computers.